You won't see this often! Just feast your eyes on this table. Sparkling, ready-for-company, and pristine. All ready for the CQTeers groups to come today to create and share. We will not, however, discuss the fact that just behind the door you see behind the table, utter chaos reigns. No, we will not even THINK of it!! The other two pictures show the fun things I received in the atc trade AND two little booklets that Irene made showing pictures from her trip to Japan. Really nice! Be sure to click on the pictures to enlarge so you can see the details. This bag was at my local fabric store and I think it will be just perfect to hold my circular knitting needles (which are a beast to store). I don't know if you can see in the picture, but the 'pages' are all velcroed in the middle so they are removable, which means I can make MORE pages that will be the perfect size. I didn't need this bag, but it came down to that nasty word, want. Bah. 1. We will not speak of the new clothes I got today. No, we will not speak of them, because I am carrying a humongous amount of guilt at the moment. The fact that I have never (not in my whole 50 plus years) had two count 'em new outfits unless they came from the thrift store. My DH keeps telling me to just get over it, but it's so hard to justify spending money on myself. 2. We also will not discuss that I have placed yet another book on my wish list. Quilting Arts sent me a notice today about a new book called 'Creating With Fabric' by Jill Haglund. I must remember 'thou shalt not covet' and put it from my mind. 3. Meant to mention this yesterday...I was looking for some quotes about coffee and tea and found some great ones on this site: http://www.quotegarden.com/ They have pretty much every subject covered, so if you're looking for something for your art, check them out! Three pictures today. I know, I'm getting carried away!! Picture one is of my completed piece for April for the TIF challenge. I finished in time which was a surprise for me, but I'm glad. Now to see what the colours are for May! The other two pictures show the cover for a round robin book the CQTeers group is doing. My theme is Coffee or Tea. This cover now will be passed on to another member of the group and they, in turn, will add a page to my book. The page size/shape is whatever the individual artist chooses, with the only 'rule' being that the margin (where it will be sewn together) be consistent with each page. Fabric, paper, or whatever each artist chooses to do is all good. Can't wait to see what it becomes!! p.s. Yes, I know how to use paragraphs...and yes, I did use them. Can anyone explain why Blog-grrr decides to overlook that fact sometimes and allow them other times? V-e-r-y frusterating!!! Today my friend Kym was here for a sew day so I got quite a bit done on my block. There's only one or two more sections to complete and three seams and I hope to do those tomorrow. Hey Arlee...do you recognize that button on the left side?? Thank you!! I managed to get some stitching time today and the picture shows what I've added to the TIF piece. I forgot yesterday to credit the design on the bottom right of the picture to Mary Corbet of Needle'nThread.com . Thank you Mary! Quite obviously I can't spell. Yesterday's title...progect?? Ummm...should have been PROJECT! Sorry 'bout that. Yes, I know computers have spell check - I just have to remember to use it. Further on yesterday's post...no, I don't know what the song is. I've never asked because I know it's something special that means a lot to the couple and I thought maybe they might not want to share it. I've been stitching away today, working on the April TIF challenge and the picture shows the progress so far. I have decidedly had a late start on it, so I will have to hussle to get it done by the end of the month. I don't suppose the world will come to an end if it isn't finished by then, but I will be upset with myself. 'Tis finished and I'm glad. Now it remains to be seen if they like it!! How come it looks better in the picture? I know I don't normally post on the weekends, but I had to show the results of my labours tonight. I read somewhere about using the proverbial white glue/water mixture to glue down various layers of textural bits, beginning with a dryer sheet on the bottom. It said to add a layer of netting on the top. Hmmm....said netting refuses to glue down AND with all the glue throughout the layers I strongly suspect it might take a month to dry. It also said to paint the whole thing once it dries and that I would be left with a wonderfully textured piece of 'stuff'. Well, I believe the part about it being stuff all right! Makes me think of the old children's rhyme that begins with 'great green gobs of gishy-wishy-gopher-guts'. Methinks I'm going to take this stuff and stuff it!! Here are the pictures from yesterday (finally). All buttons and they are clickable to enlarge if you so desire. Thank you so much for all the encouraging comments about my stencilling job today! I appreciate the thoughts so much. My DH helped me pretty much all day and made an excellent 'go-fer'. He's a good brush-washer, lunch-getter, and encouraging-worder. The job is pretty much done with only a couple of hours more to put in tomorrow. I will take pictures, I promise!! I have pictures. I actually accomplished something today but you can't see what I did because for some reason Blogger is being obtuse about posting pictures today. Tomorrow is 'the day' when I will start the stencilling on my friends wall and I'm still not looking forward to the prospect. She assures me I was every bit as apprehensive the last time I did it, but I guess it must be like childbirth because I don't remember it. DH has promised he will help me with the measuring so that should make the whole chore go a little faster. I just have to remember to stay away from caffeine!! It was a treat to go outside this afternoon...no coat! Of course we still have a huge pile of snow in the backyard, but everywhere else was warm. Even the little chipmunk was out today, getting his supply of peanuts stocked up after the long winter. My dad sits out by the garage and takes great delight in his little pet. We just wish the locals would keep their cats inside. ...to another book for my collection. We won't mention that I've ordered yet another one too. I just picked this one up today and haven't had a chance for a real good read yet, but it looks quite good. 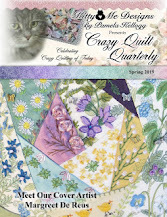 It's not a 'how-to' book as such, but focuses more on the history of crazy quilting. There are tons of beautiful photos of antique CQs, a section of embroidery motifs, and also some techniques. 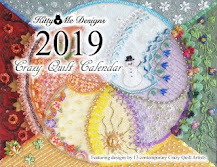 I'm such a crazy quilt book-junkie and simply cannot resist anything new that comes out (and would LOVE to get my hands on the out-of-print 'Crazy Quilts' by Penny McMorris). I really would hate to tell you just how many books I own on the subject, but there is always room for more. I read them too!! This is the second try for this post. Argh! Picture is of a beaded button I made today sitting on my obviously paint-covered table. It's one of three buttons I'd like to make. The colours aren't 'true' in this picture, but you can get the idea. My friend Jacquie was here for our weekly crafting time (coffee & munchies too). DH made an incredible quick bread from our new cookbook (The Taste of Home Cookbook) and I just have to share the recipie with you. It is really good!! Combine flour, sugar, poppy seeds, baking powder & salt. In a small bowl, beat the egg, milk, butter, vanilla & lemon peel. Combine two mixtures just until moistened. Fold in cranberries. Pour into greased loaf pan & bake at 350 for 55-60 mins. or til toothpick inserted near the center comes out clean. Cool for 10 mins. before removing from pan to a wire rack to cool completely. Combine icing ingredients and drizzle over cooled loaf. Take a look at this sewing machine from the early 1920's. Son#2's fiance picked it up at an antique show and it actually works. The case is original and looks pristine. The only thing that appears missing is an instruction manual, which she hopes to get from Singer. Lucky girl!! Today was one of 'those' days when I didn't get to do anything I wanted to. The only thing I've accomplished is to basecoat a bunch of little wooden hearts. I'm so under-impressed. I've been commissioned to stencil a piece of music & flowers on a friend's wall and this is the beginning of cutting the stencils. It's yet another 'owie' on my fingers, but it has to be done. The original idea/pattern came from a book called 'Stencilling - A Harrowsmith Guide' by Sandra Buckingham. This is the second time I will have done this particular piece of artwork, for the same person! I originally painted it over ten years ago. They have re-painted their walls in a different colour and have requested that I re-do the art because they liked it so much. I'm scared skinny that I will muck it up and I know I was equally as scared last time around. Nice to know that nothing changes! Yes, today I suffered from all three. All that for this non-descript 'thing' you're seeing in the picture. What is it you ask? And why should it cause all that pain? 'It' is a case intended to hold a camera lens. #2 son purchased the lens but couldn't get a case to fit, so...good ol' Mom came through and made him one. He wanted it semi-waterproof so enter the use of plastic, which is next to impossible to sew with. Darn stuff likes to shift and stick on the machine. Before you ask, yes I know to use paper under the seams. Once I got the design figured out - which would have been so much easier if I had the lens in hand - things went not too badly (other than the plastic issue). However, all the injury to my person and my psyche came with putting the drawstring in. My arthritic hands are not meant to have to force a safety pin (actually it was 4 safety pins by the time I was done) through the casing in order to feed the cording through. What dummy me was it that thought making the outside shell from medium weight denim was a bright idea? Why don't they make safety pins that stay shut under duress? Why do said safety pins have such a burning desire to embed themselves in nice soft areas (like fingers) when you least expect it (hence the 'blood' part of this saga). The tears part came when stupid safety pin #2 managed to embed itself (to the bone, I might add) in the EXACT same spot as safety pin #1. Mother love - isn't it wonderful? Today there will be more of the mumbling-sort of notes. Sorry, still no pictures because what I've been working on can't shown yet! Have fun exploring. Hope you find something interesting! Today is a mumbling day so y'all have to suffer along with me because if I don't mumble, I got nottin! First...see that ugly, ugly picture? That's the remains of what was over a seven foot tall pile of snow in our backyard. It's still close to six feet in the middle. Maybe it'll be gone by June? Third...DH and I spent a few hours yesterday wandering about in Toronto at the Spring Home Show. My tootsies are not likely to be the same!! Wow, was that show HUGE!!! I was a bit disappointed though because I was hoping for lots of displays of furniture and decorating. We aren't searching for hot tubs, a new roof (well, Jack could argue that point 'cause I know he'd love a new 'roof'...hair! ), marble floors, and such but would love some ideas for sprucing up the look of our house. Marble floors are not in our budget! Fourth...My tootsies weren't the only sore part of my anatomy yesterday. Since I seem to need to learn things the hard way, I shall tell all so that you don't attempt what I did. You know how the only decently pretty bras seem to be sold with those horrible underwire instruments of torture? It is NOT a wise idea to try to remove wires whilst semi-wearing the bra, especially if you're using a pair of scissors. Nope I didn't cut myself but gave my poor double D one heck of a bruise when the scissors finally decided to cut and the handles snapped shut (with tremendous force, I might add). ouch. Take a word from the newly-wise folks, and don't try that at home (or anywhere else). Fifth...I am working on a project, but can't show it here (yet). I will when it has arrived at its destination. Sixth...I heard via the grapevine that there's a new crazy quilting book just out...'Crazy Quilting - The Complete Guide' by J. Marsha Michler. If this book is as good as 'The Magic of Crazy Quilting' I know I want it. I'm sure if you want further info, you could check it out on Amazon. Ok, that's enough mumbling for today!! Just look at what came in the mail today (please click on it to enlarge...for some reason my camera was being obstinate about doing a close-up). I'm doing a trade with Ebony (grandaughter of Doreen of http://doreeng.blogspot.com ) and this is what she sent me. Ebony is just eight and makes remarkable atc's and loves to trade them. Isn't it nice when we can assimilate someone that young into the world of making art? Just look at what I've done. In the past two days I've purchased all of these. Why, oh why do I allow myself to even enter a bookstore? I've got quite enough books and magazines in my studio now and I really, really don't need any more. Get thee behind me, Satan. In my defence...ahem....I have all of Yarn Harlot's books and just couldn't not have the newest one too. After all, it would ruin my complete set if I didn't get it. The 'Studios' issue from Cloth,Paper, Scissors is necessary to help me organize my studio....right? Ummm....A Needle Pulling Thread is a newish Canadian magazine and a) I should support Canadian magazines and b) it has a good article on stumpwork which I've been meaning to learn to do. So, that was a necessary purchase...right? As for the Somerset Life? I plead insanity. There has to be somebody out there that would like to get some art in the mail?! You only have to find one person to agree to do it - the other two are already signed up. C'mon...you know you want to! Referring back to yesterday's post, does anyone want to join me in doing three (only three) art cartons? I'm looking for one more person to swap with me! The basic idea is that I decorate a 1L carton (the type that milk comes in) and fill it with three of my creations (can be things like atcs, postcards, little art dolls, or whatever strikes your fancy) and send it to you. You, in turn, send one of yours to me; one to the person whose name will be included in my carton; and the final one to someone who agrees to the exchange. That's about as simply put as I can get it and I hope you can figure it out. The contents of the cartons can be pretty much whatever you like, as long as you include three small pieces of your art (whatever that may be). If you choose to add more things, that's entirely up to you. As you can see from yesterday's picture, Donna included more than was required in the rules (thank you again Donna!). If you're interested, the first one to leave a comment here will get a carton of goodies from me and you're on your way!! Lots of fun! Just look at the wonderful goodies I received in the 'Art-In-A-Carton' swap!! This is the first of three boxes I will receive. I was so excited to open the mailbox today! This box came from Donna of http://quiltpixie.blogspot.com . See the wonderful postcard in the middle? Make sure you enlarge the picture so you can see the details on it and on the felted lady!! In return, I send a box back to Donna, one to a person whose name is inside my carton, and one to someone who would like to take part in the swap too. Further details are at http://art-in-a-carton.blogspot.com (scroll down to read the post from Jan.20/08 for the instructions). Basically you have to send each of 3 people, three items of your art inside a carton. Of course you're free to add more things to fill up your carton!